Anon. sale, Parke-Bernet Galleries, Inc., New York, 10 March 1971, lot 56. Acquired at the above sale by the late owners. M. Laffaille, Raoul Dufy, Catalogue raisonné de l'oeuvre peint, Geneva, 1977, vol. IV, p. 147, no. 1582 (illustrated). Atlanta, High Museum of Art, Georgia Collects, January-March 1989, p. 14 (illustrated). 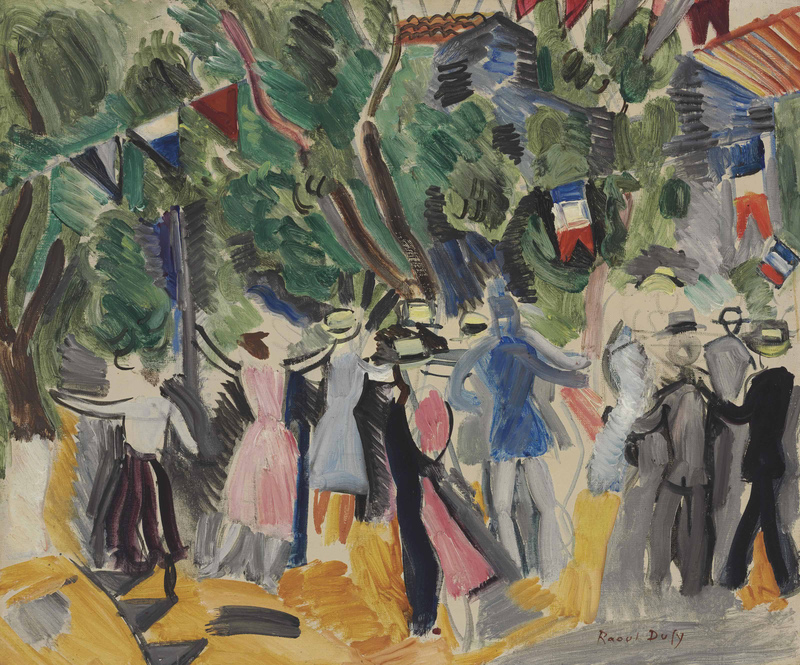 In 1905, the Fauvist exploits at the Salon d'Automne had strongly impressed the young Dufy, who embraced colors and flowing lines following the example of Henri Matisse. It was, however, Albert Marquet who showed Dufy the path towards Fauvism: the two artists spent the summer of 1906 painting together in Le Havre, Trouville and Honfleur. In Le Havre they celebrated, Bastille Day, and Dufy commenced a series of thirteen paintings, which define the very essence of Fauve painting. These works were, in fact, painted at the height of the artist's affiliation with this radical movement. Dora Perez-Tibi has written, "[Dufy] kept creating new variations on the subject like a composer constantly repeating his melodic phrase. This procedure reveals his full control of his means: he gives free rein to his lyricism in order to transpose reality to the advantage of his poetic and visual imagination. From this point onwards, Dufy's work exhibits a tendency in common with the Fauves: rather than painting a favorite theme from life, he will be able to paint it in his studio, allowing his imagination to recreate it" (Dufy, New York, 1989, pp. 29-30). From 1919 onwards, Dufy continually returned to Vence, the southern base of his studies on Cézanne. It is here that a mature and original pictorial style becomes apparent, as his experiments under the influence of Impressionism, Fauvism and Cézanne's Cubism made him more aware of his own abilities. By the time Dufy painted Le Bal in 1920, he had found his own style: brilliant and direct colors are combined with simplified figures and schematic compositions, which vividly evoke the lively narratives of modern life. His short, parallel brushstrokes lend a dynamic quality to the flat construction of geometrical forms, revealing his investigation of form and space in a brightly saturated variation of the cubist style. Confronted with the light of the South of France, he reinvented it and distributed it over broad areas of color modulating the surface of the painting with rigorously juxtaposed, simplified planes. The year the present work was painted also proved to be a milestone in Dufy's career. In April he signed a contract with the Galerie Bernheim-Jeune, which gave him a one-man exhibition in 1921. This was the first time that his talent received recognition, and from that point onwards he received numerous public and private commissions.